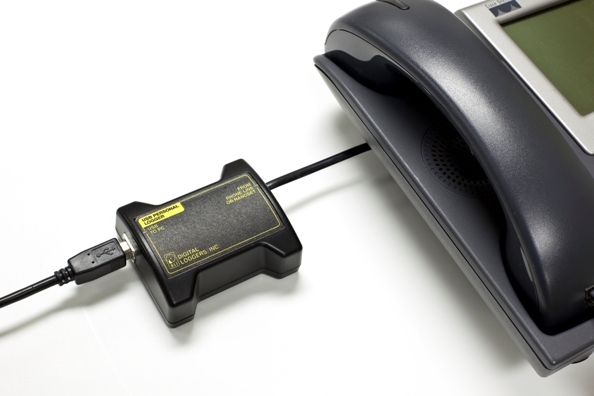 USB Call Recorder $99! Risk Free, Overnight Shipping! Record from phone lines, voice mail systems, handsets, radios and microphones. Connect to an outside line to record every extension. Audio recordings are perfect. Multiple copies of recordings can be made without degradation. Record to a hard drive or network server for reliable storage. Voice activation keeps all your calls organized in time-stamped directories. Like to know who's calling? Display the name and address of the caller with Caller-ID and call tracing. Sort instantly by caller-ID or number dialed. Did you miss something important? Maybe an address or order information? Replay calls instantly, even while recording. Find calls quickly. Digital files can be copied, emailed, encrypted, and backed up on any computer. Capture Windows screens with order information, emails, etc. Save, organize, and email them with your call recordings. Caller-IDs pop Outlook contact information and notes automatically! Search for calls quickly. Sort and print call lists. Our sophisticated Evidence Builder Software is included free! Order Now - Risk Free Trial! Try it today. Order direct via Amazon, from Hello Direct, Headsets.com, or your favorite dealer. Try it risk-free. Like more information? Download the specs,or browse an installation guide.